This book provides a comprehensive and systematic introduction to the fundamental concepts, major challenges, and effective solutions in wireless sensor networking (WSN). Distinguished from other books, it focuses on the networking aspects of WSNs and covers the most important networking issues, including network architecture design, medium access control, routing and data dissemination, node clustering, node localization, query processing, data aggregation, transport and quality of service, time synchronization, network security, and sensor network standards. 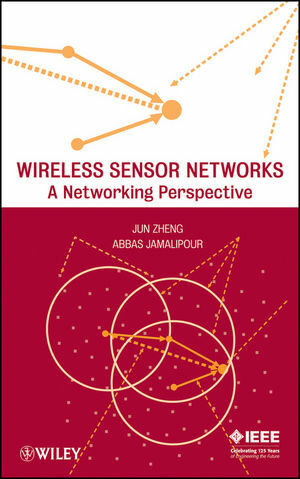 With contributions from internationally renowned researchers, Wireless Sensor Networks expertly strikes a balance between fundamental concepts and state-of-the-art technologies, providing readers with unprecedented insights into WSNs from a networking perspective. It is essential reading for a broad audience, including academic researchers, research engineers, and practitioners in industry. It is also suitable as a textbook or supplementary reading for electrical engineering, computer engineering, and computer science courses at the graduate level. Jun Zheng, PhD, is a Professor with the School of Information Science and Engineering of the Southeast University, China. He has been involved in extensive research and development in the field of telecommunications engineering for many years. He is a technical editor of IEEE Communications Magazine and the online magazine IEEE Communications Surveys & Tutorials. He has coauthored one book and has published a number of technical papers in refereed journals, magazines, and conference proceedings. An award-winning scientist in the communications technology field, Dr. Zheng is a senior member of the IEEE. Abbas Jamalipour, PhD, is a Professor of Wireless Networking at the University of Sydney, Australia, where he is responsible for teaching and research in wireless data communication networks, wireless IP networks, network security, and cellular communications. He is the Editor in Chief of the IEEE Wireless Communications and technical editor of IEEE Communications Magazine and the International Journal of Communication Science. Dr. Jamalipour has authored or coauthored a dozen books and has published more than 190 papers in major journals and international conferences. He is a Fellow of the IEEE and Engineers Australia, as well as an IEEE Distinguished Lecturer.